We succeeded in painting the following graffiti on walls in the Bío Bío Region. We do this as part of the call to agitation in memory of our comrade, the young fighter for animal liberation, Javier Recabarren. 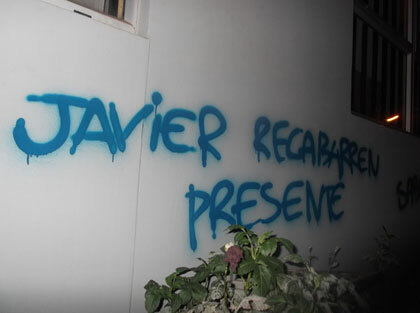 We moved with the same courage with which the young combatant and antiauthoritarian fought, so in many areas of the southern lands we have painted two of the large chains of Chilean pharmacies known as Farmacia Cruz Verde, writing 'No to animal experiments' and on different walls in the region messages of 'sabotage the laboratories,' 'Javier Recabarren is here,' 'until all the cages are open' as well as hitting various carnivorous distributors, among them Super Cerdo, Super Pollo and others. With this gesture of solidarity we remember the young Javier Recabarren, the same we see in photographs on a pamphlet on the web, burning a flag, throwing stones at Pakos, and in stories read from the struggle on the streets in demonstrations, lifting barricades for animal liberation, in solidarity with prisoners at war, and that's why we respond to the call to agitation in memory of Javier and we remember and share that animal liberation is part of the fight against all authority and all form of submission, as it is also a part of the struggle on the street that heats the pavement in different parts of the world, as every manifestation and as each animal liberated, as each banner, graffiti painted and pharmacy, laboratory and zoo sabotaged. Javier in the incendiary and combative memory of total liberation. Until the last of the cages are opened and afterwards destroyed! *Javier Recabarren was an 11-year-old, vegan activist who fought for the closure of the Santiago zoo, among other activism. He was struck and killed by a city bus on March 18, 2015. Nos adjudicamos las siguientes rayadas en los muros de la región del bío-bío hacemos presente al llamado de Agitación en memoria al compañero y joven combativo y por la liberación animal, Javier recabarren. Nos movimos con el arrojo que el mismo joven kombativo y antiautoritario luchaba, por eso en numerosos sectores de las tierras del sur hemos ido rayando dos de las grandes kadenas de farmacias $hilenas conocida como -farmacia cruz verde- escribiendo “No a los experimentos en animales” y en diferentes muros de la región con mensajes de ”sabotaje a los bioterios” ”Javier recabarren presente” ”Hasta abrir todas las jaulas” y tachando diversos distruibidoras carnivoras de los sectores entre una de ellas ”Super cerdo” ”Super pollo” y distribuidoras locales del sur. Con este gesto solidario recordamos al Joven Javier recabarren, el mismo que apreciamos en fotografía de un panfleto de la web quemando una bandera, lanzando piedras a los pakos, y los relatos leídos de la lucha callejera en manifestaciones levantando barrikadas por la liberación animal, funando a los zoológicos, solidarizando con lxs kompañerxs presxs en guerra por eso respondemos al llamado de agitación en memoria de Javier y nos hace recordar y compartir la liberación animal la que es parte de la lucha kontra toda autoridad y forma de sometimiento, como también esta es parte de la lucha callejera que llena de calor los pavimentos de los diferentes puntos del globo, como cada manifestación y como cada animal liberado, como cada pancarta, rayado y farmacia, laboratorio y zoológicos saboteados. Javier en la memoria incendiaria y combativa de la liberación total. Hasta que la última de las jaulas sean abiertas y después estas destruidas!